Slow Moving Clouds are a band based in Dublin, Ireland. They bring together roots in the Irish and Nordic folk traditions with post-punk drones, baroque strings, and soaring falsetto vocals  creating an immersive, atmospheric sound unlike anything you've heard before. Ultan OBrien is a fiddle player and violist active in the worlds of performance, composition, and education. Ultan began learning the fiddle at a young age from a variety of musicians in county Clare. He has since studied contemporary and classical music for violin in Dublins Conservatory of Music and with Tamás Ittzés in the Kodály Institute in Kecskemét, Hungary. 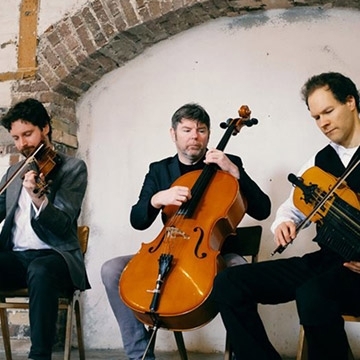 Alongside Slow Moving Clouds, Ultan performs, tours and records traditional and contemporary Irish music as a soloist & with a number of groups/bands including traditional Irish music ensemble Skipper's Alley and the Scottish/Irish/Manx collaboration Aon Teanga:Un Çhengey. Kevin Murphy is an experimental cellist and composer whose dynamic and innovative approach continues to challenge the accepted scope of music for cello. He has been involved in numerous collaborations over the past 25 years spanning several genres. Kevin has co-composed the soundtrack to Academy Awards long-listed Juanita Wilson's film Tomato Red. He also co-composed the score for The Lodgers which was selected for the Toronto Film Festival 2018.